Michaela Rae: My First Giveaway! A couple of days ago I made a Books Worth Reading board on Pinterest. It got me thinking about how/why some of my favorite books have affected my life. I started to see a funny pattern among them. First, the majority are biographies, and secondly, it's almost always a story of how someone endures extreme hardship and lives to tell of God's goodness, even in suffering. I suppose these books speak the loudest to me. I'm so encouraged by stories of God's faithfulness and the perseverance of saints. They help put things in perspective - I realize how blessed I am and I'm also challenged to be courageous and faithful in my own life. 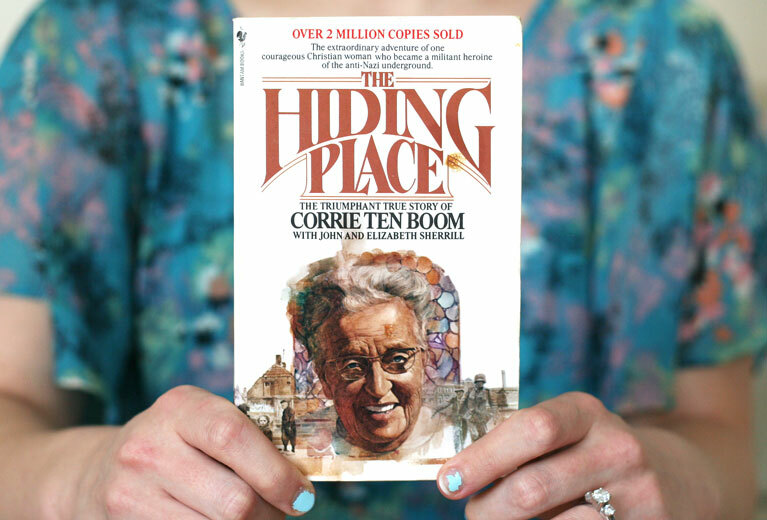 The Hiding Place by Corrie Ten Boom, is one such story and perhaps my favorite book of all. I'm sure my mom read it to me first when I was young, but I've since read it at least five times. I now revere Corrie and her sister Betsie as heroes of mine. The story of The Hiding Place begins in Holland at the start of WWII. The Ten Boom family runs a watch and watch repair shop out of their home but soon find themselves in a new type of business - the business of hiding Jews. Corrie and her family quickly become the center of the anti-Nazi underground as they hide Jews in a secret room in their home. Eventually however, they're betrayed and sent to Hitler's concentration camps. Corrie writes about how she and her sister, Betsie, find a new type of hiding place for themselves and the Jews in the camps. A hiding place where God is their refuge and strength. Today, I've decided to give this book to one reader. :-) I hope it will bless your life as much as it has mine. And if you've already read/own it, it could make for a great gift. The copy in the picture is my own, but I'll be sending you a new one. 2. Leave a comment and tell me what your favorite book is and why. Please include your e-mail address so I can contact you. 1. Follow me on Twitter and leave an additional comment to let me know. 2. "Like" MichaelaRae on Facebook and leave an additional comment to let me know. I'll announce the winner on May 30th! Winner announced here. This post is linked up at Try New Adventures Thursday. Link your weekly adventures up! I loved that book too. What a wild story. How to pick your favorite book? So many greats! Time Traveler's Wife is amazing and heart wrenching.Of course The Bell Jar too and Hunger Games Trilogy is great! I've never read that book but it sounds very interesting. My current favorite book is North and South. I love you it combines fictional England with a little romance. I follow you! AND, this is my favorite book! Which is why I'm entering. I have owned so many copies, but I loan them out and they never find their way back. Seriously, The Hiding Place is such a wonderful book! I read it when I was young, but then re-reading it as an adult was HUGE! I mean, it really rocked my world in such a great way. And I "like" you on fb! I've never read the book before, but I know my sister has talked about it. I love (and write!) Young Adult literature, but my favorite book in the world is hands down To Kill a Mockingbird (I even named my pup Radley!). I've followed you on Facebook and Twitter...hot diggity dog!